Not a who done it, The Execution of Noa P. Singleton is more of a “why’d she do it?” with a little bit of “did she really?” thrown in. The premise: at the tender age of 25, Noa’s on death row, just six months from execution for the murder of a pregnant woman and her unborn baby. She spoke not a word in her own defense. Now, her victim’s mother – a prominent lawyer – has stepped forward to help Noa avoid execution. Why? Because she wants to know what happened. And Noa’s the only one who can tell her. It’s a suspenseful set-up, and author Elizabeth Silver makes the most of it. Although the book is in first person from Noa’s perspective, the reader is kept guessing as the story unfolds in two threads: what’s happening in present day and Noa’s memories. As is so often the case, it’s the past which drives the present. And the countdown to X-Day is always tick-tick-ticking in the reader’s subconscious. 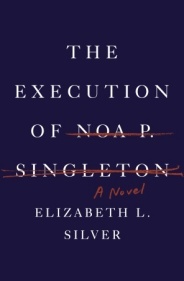 The Execution of Noa P. Singleton is an amazing debut novel, and I will be amazed myself if it’s not one of the finalists for the Mystery Writers of America Edgar Award for Best First Novel when they’re announced next spring! If you liked Gone Girl‘s unreliable narrator, you’ll like this one, too. PS- And speaking of Gone Girl, I hear a movie’s in the works. Look for Ben Affleck as Nick and potentially Rosamund Pike as Amy Dunne. This entry was posted in Commentary, Review and tagged debut, Edgar, Elizabeth L. Silver, Gone Girl, MWA, Review, The Execution of Noa P. Singleton. Bookmark the permalink.